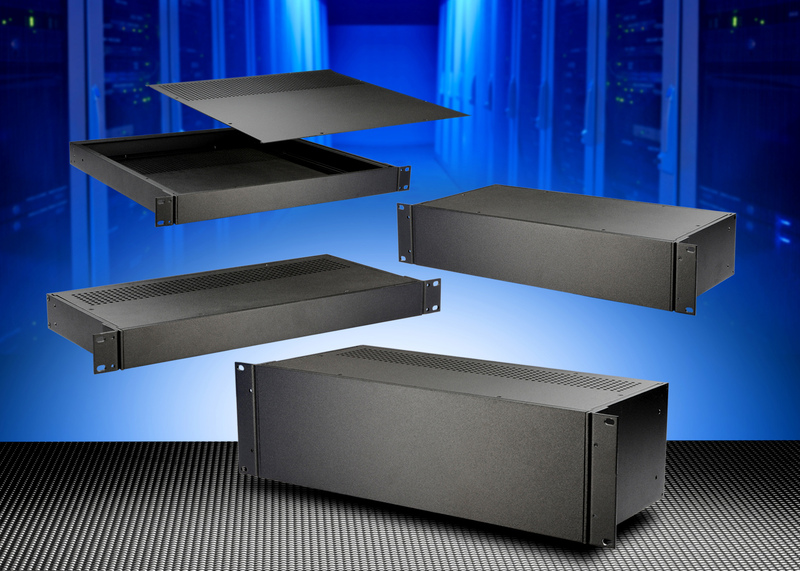 Hammond Electronics has introduced 4U high versions and added extended 559mm depths to all heights of its RM family of 1U - 4U 19 inch rack mounting and desktop enclosures. 1U to 3U half-width versions are also available. The all-aluminium construction consists of a heavy-duty extruded frame with removable vented or plain top and bottom covers. The 19 inch units are supplied with rack mounting angles; both 19 inch and half width variants come complete with self-adhesive rubber feet for when the enclosure is to be used as a desktop unit. The front and rear panels are removable and interchangeable; their flat design makes machining and printing a simpler process. Front panel handles are optionally available to assist with insertion and removal of the 19 inch units from a cabinet. Adjustable rear panel mounting angles are also available as an accessory for the 457 and 559mm deep units to give greater support for heavy components.